This past week the American Association of Individual Investors reported bullish investor sentiment declined over seven percentage points to 20.04%. 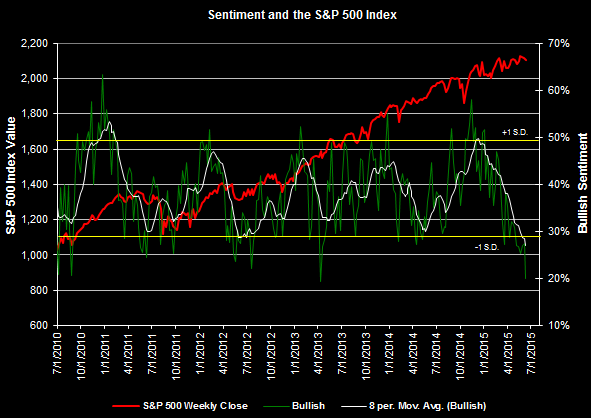 This is the lowest sentiment reading level since April 11, 2013 when bullish sentiment was reported at 19.31%. The Individual investor sentiment reading is considered a contrarian indicator. As such, low levels of bullish sentiment suggest future equity market returns could be favorable. The thinking is individual investors become most cautious on equities at market bottoms. 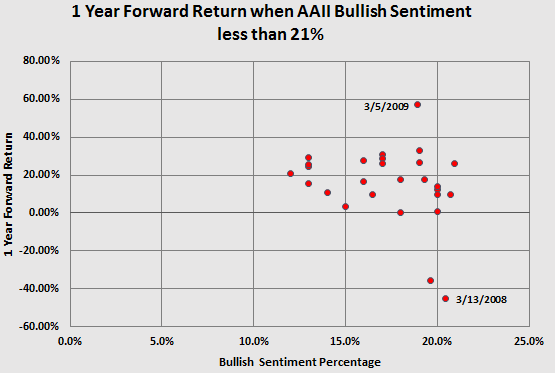 The below scatter chart displays one year forward returns for the S&P 500 Index when the AAII bullish sentiment is less than 21%. There were 27 months going back to July 1987 where sentiment levels were below 21%. If low sentiment readings occurred in multiple times within a month, the lowest sentiment reading was chosen in that particular month. As seen in the chart, except for the most recent financial crisis period in 2008, one year forward returns are mostly favorable when individual investor bullish sentiment is at a low level. The average return for the readings on the chart is 17.34%. The difficulty for investors today is the equity market seems to have a mind of its own by continuing to move higher nearly uninterrupted for over three years as noted by the red line of the S&P 500 Index in the first chart. Equity market corrections generally do not occur when expected and much of the recent market commentary has focused on the nearing correction as well as the stretched market valuations. Certainly a decline in equity prices could be around the corner. And sentiment readings are not to be construed as the gold standard of market direction; however, the low bullish sentiment level on its own suggests equity prices could continue to grind higher.